Under what conditions surgery of trigger finger or thumb is necessary? What is done during surgery? Where in the operation, the skin-incision is made? Is the operation done outpatient? What is percutaneous trigger finger release? If the end joint of the thumb is fixed in an extended of flexed position (No active flexion or extension is possible). if a trigger digits fails to respond to two or perhaps three injections. The left figure shows a trigger finger in a bent position, which would be extended only with the help of the other hand. In this case, early surgery is advisable. 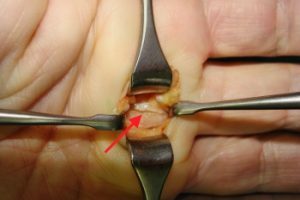 The goal of surgery is the immediate restoring of normal tendon gliding! In principle: surgical treatment consists of division of the A1-pulley. This immediately relieves the constriction of the tendon at the level of A1-pulley. Skin incision for release of trigger fingers or thumb is performed most commonly through a transverse or short oblique incision. The figure shows the exposed A1-pulley. The nerves and blood vessels are withdrawn under the hook.You will recognize the tendon sheat (A1-pulley) as a white ring. Figure left shows the longitudinal divided A1-pulley. 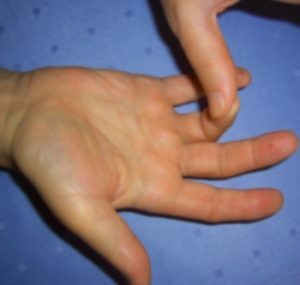 The flexor tendon of the finger is exposed. The constriction is eliminated. Tendon gliding without compromising is possible. The operation is terminated after hemostasis with suture and dressings. The surgery is performed almost always outpatient. Only in high-risk patients, treatment should be considered in the clinic. Percutaneous trigger finger release is particularly useful for middle- ring- and small finger. In principal: The pully is divided without an incision through the skin. The procedure is performed under local anaesthesia. 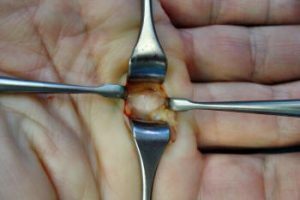 An 18 or 19-gauge needle is inserted into the tendon sheath of the affected finger. If the tip of the needle is rotate, a small piece of the A1-pulley is cut. Then the needle is positioned new in the pulley an again rotated. This is repeated until complete division of the pulley. Some surgeons perform the percutaneous trigger finger release not with a needle. They used a very small knife, which is inserted through a small incision. Perhapps there is a greater risk of nerve damage associated with the percutaneous needle release compared with an open surgical procedure. In concluding this informational paper I would like to encourage you to address all questions you may have in connection with a snapping finger or thumb with your attending physician as this document does not constitute a replacement to a personal examination or consultancy through your doctor.